It has been two weeks since we have written last time. We decided not to write last week, because we didn’t have anything special to tell. This is a compilation about last two weeks. Two weeks ago, on Sunday Mandis boyfriend Tommi came here for a visit. 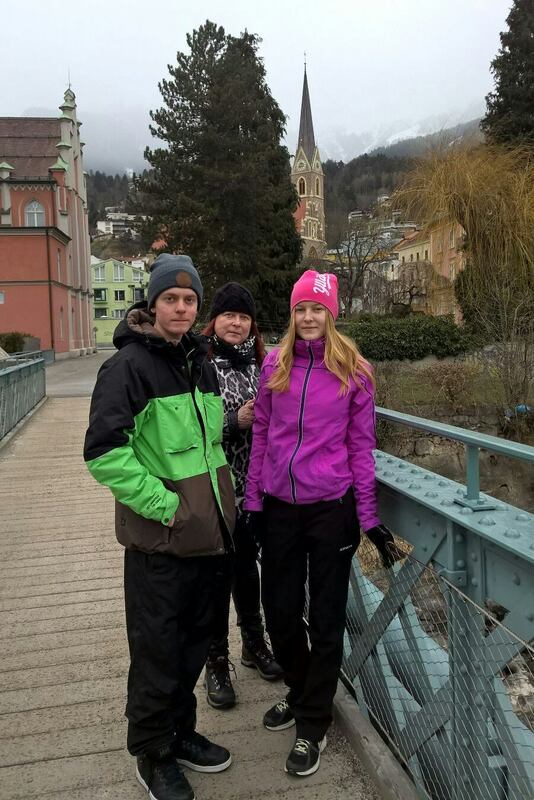 They were shopping, skiing and snowboarding and looking around the city. 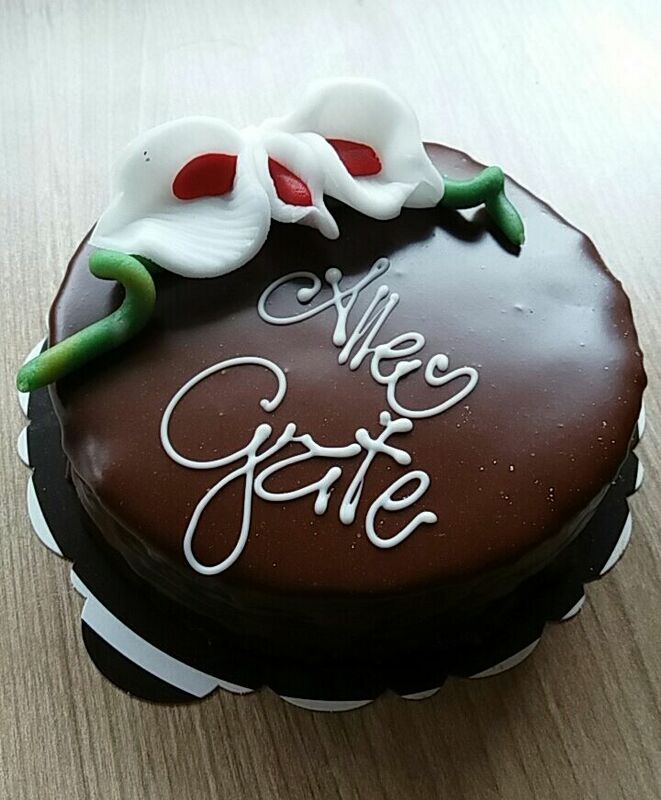 It was kind a quiet week at work because of the Easter. There were only couple kids at group lessons. 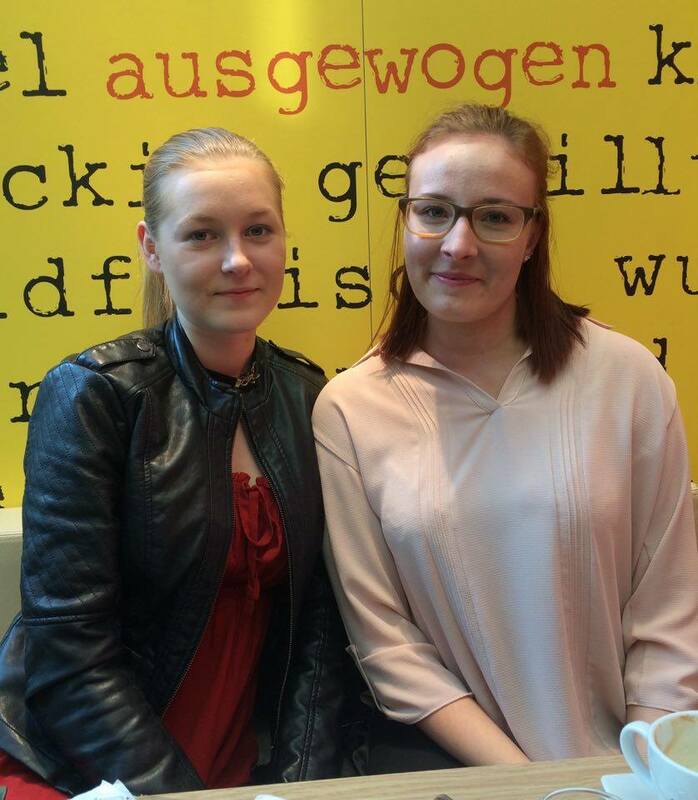 On Friday Tiia and Tanja were taking care of the Nordkettes little office because the real office worker wasn’t there. We got traditional finnish presents from Tommi and mämmi was one of them. There is no Easter without mämmi! Patcherkofel closed last Monday. This mountain is located so low that snow is melting earlier than other places. 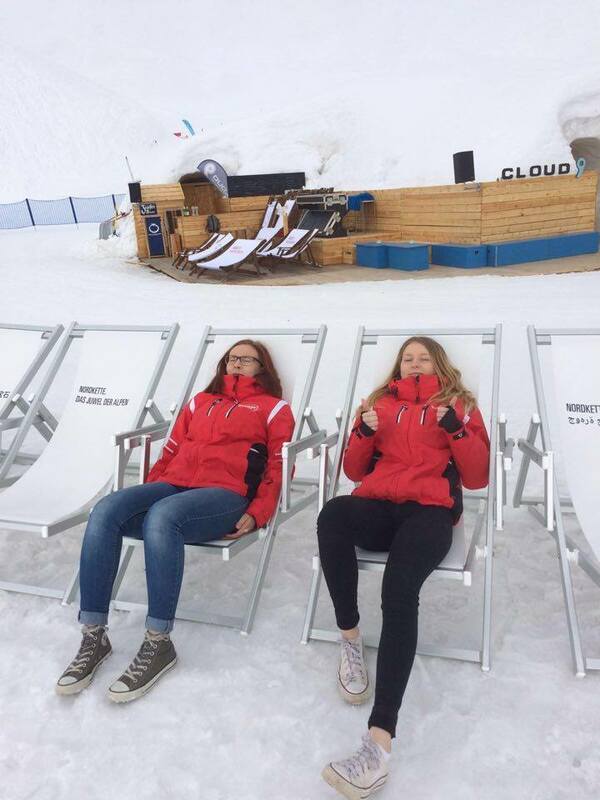 We still had work at there because we were preparing things for the summer. Our boss has a summer company which is operating biking tours. 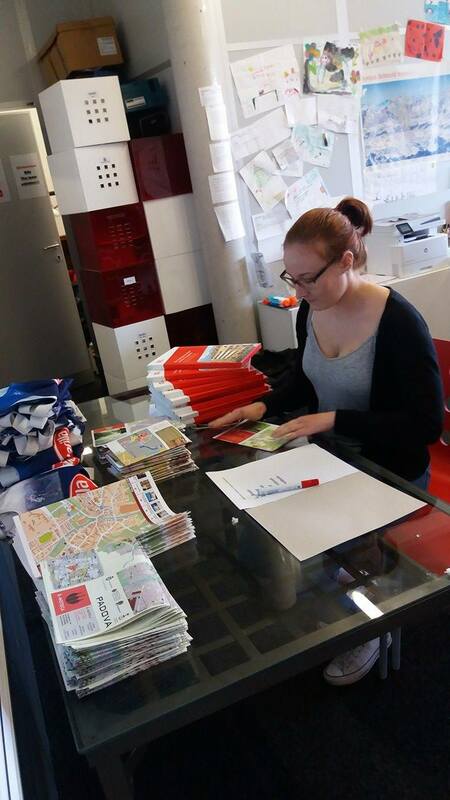 On Tuesday our lovely teacher Jaana came here. 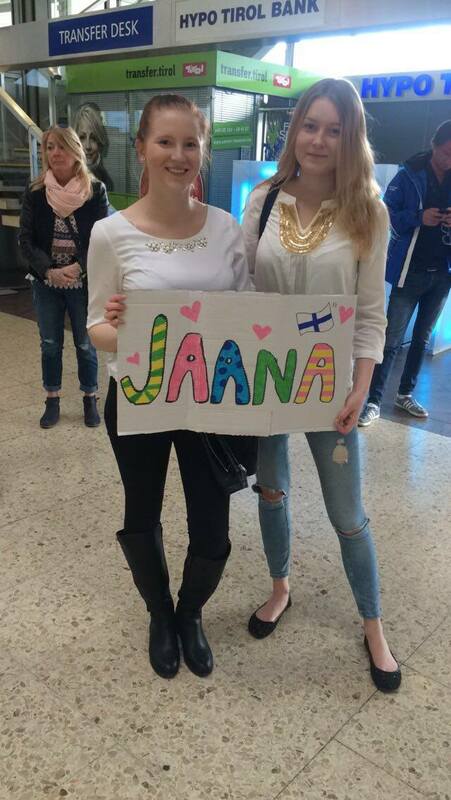 We were waiting for her at the airport with cool sign. Jaana stayed here for three nights. 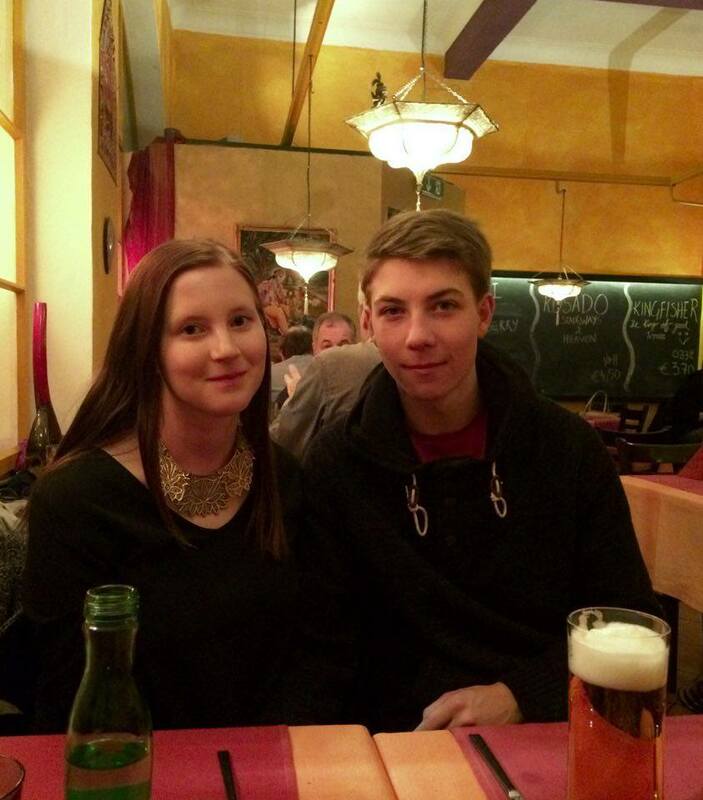 We showed the city for her, ate at nice restaurant, and visited at Nordkette and Patcherkofel with Michael. We had a long weekend and we just enjoyed life. 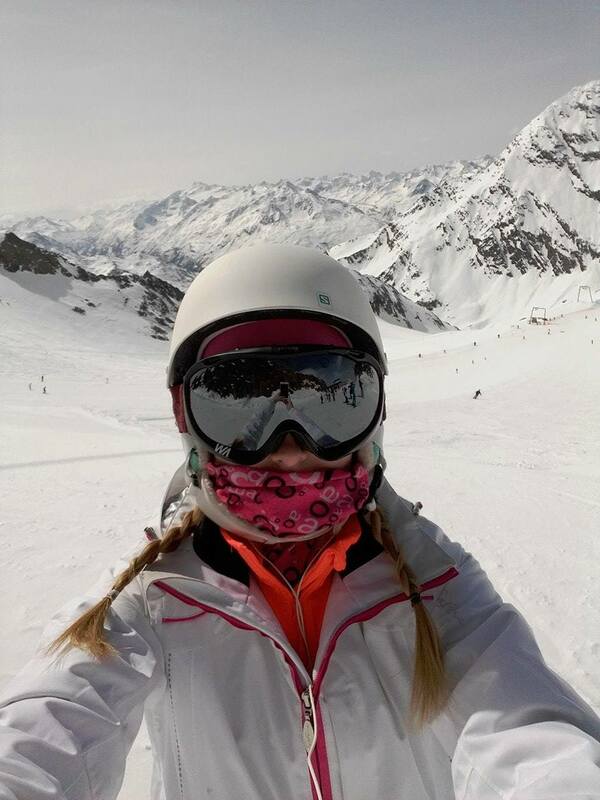 On Sunday Mandi was skiing at Stubaier Gletscher. It was an awesome place! After one week we are already in Finland. 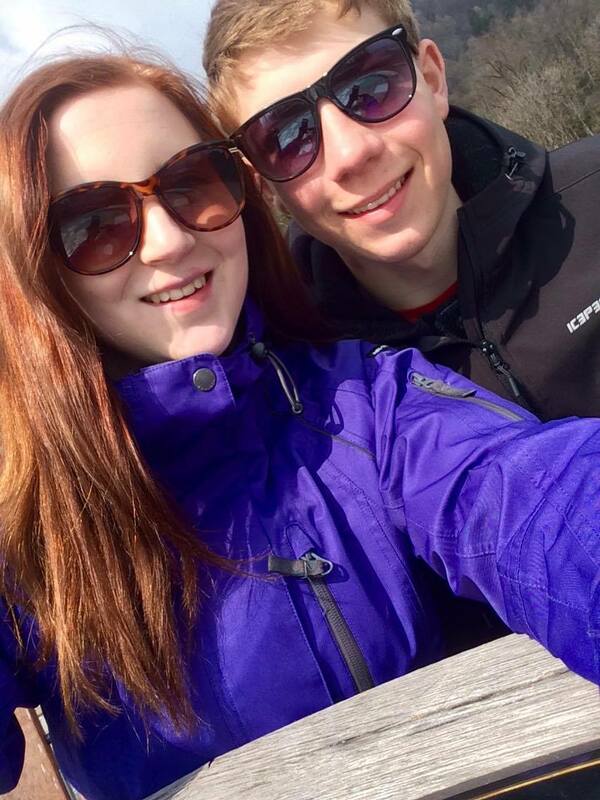 Now we must enjoy about beautiful weather and everything else! Six weeks behind and three weeks to go! On Monday Tiia was in Nordkette. 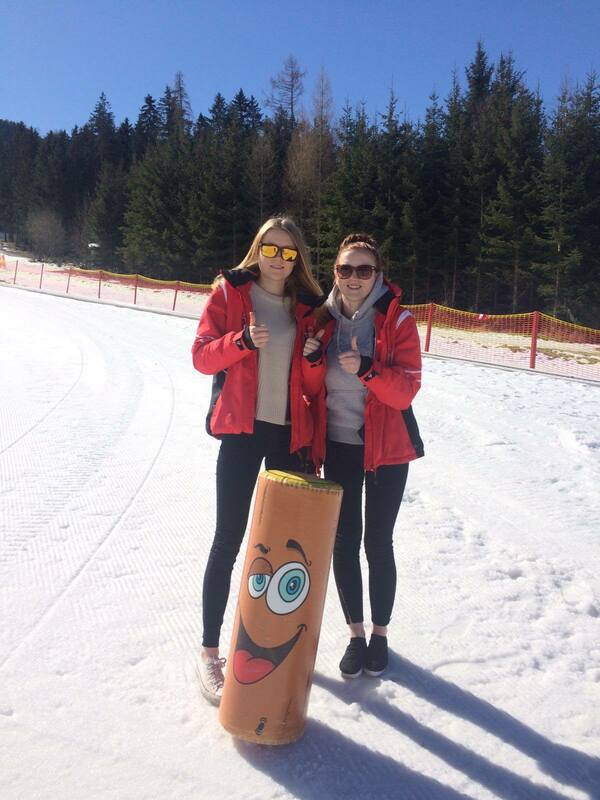 There was not so much to do, because customers were older kids and they allready knew how to ski. 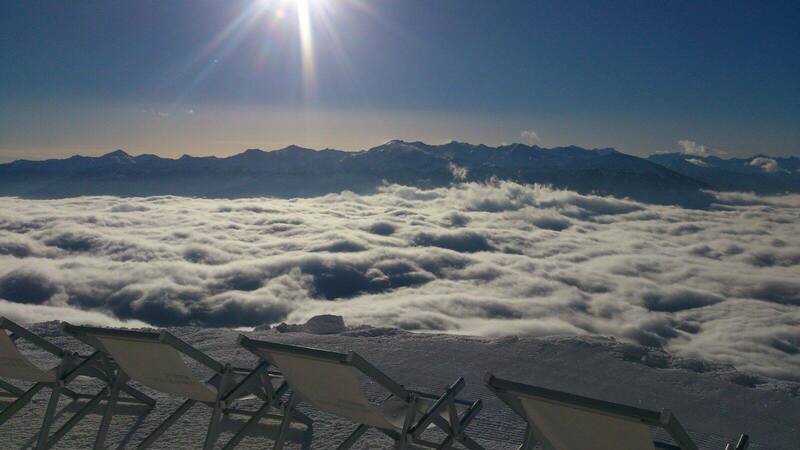 Thats why we all were rest of the week in Patcherkofel. We worked in the office and helped with little things. We joined sledding twice during this week. There was big groups from Poland. One morning our workmate Theresa has left those nice messages to us. 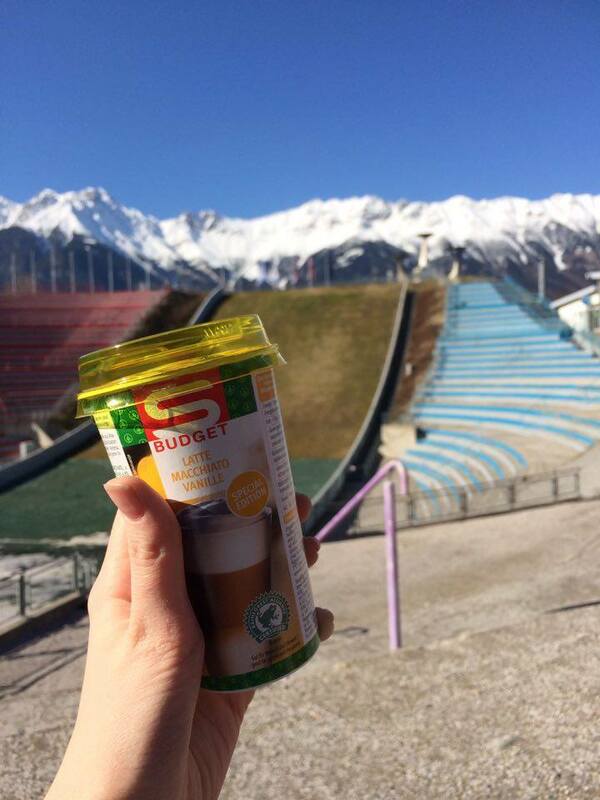 On Thursday we visited at Bergisel skijump-stadion. It was perfect weather to go there because it was so warm and sunny. We could see the whole city and mountains from top of the tower. We took packed lunch with us. 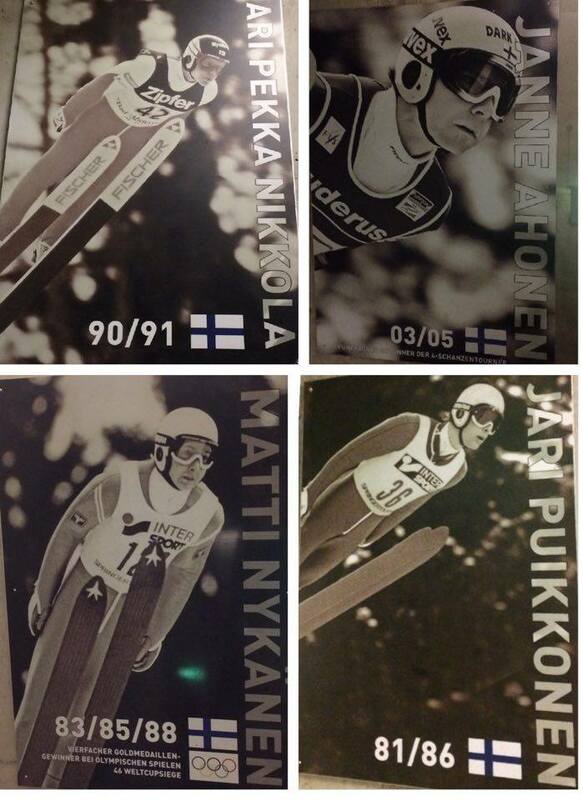 There was also pictures of finnish skijumpers. 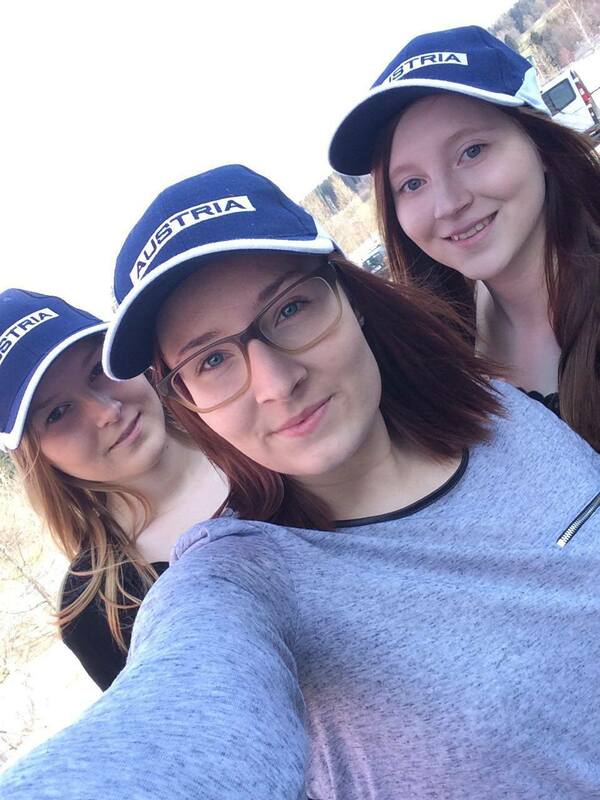 We felt so proud to be finnish! We had a long weekend, because we had also Friday off. We didn’t do anything special… Just rested and enjoyed beautifull weather. 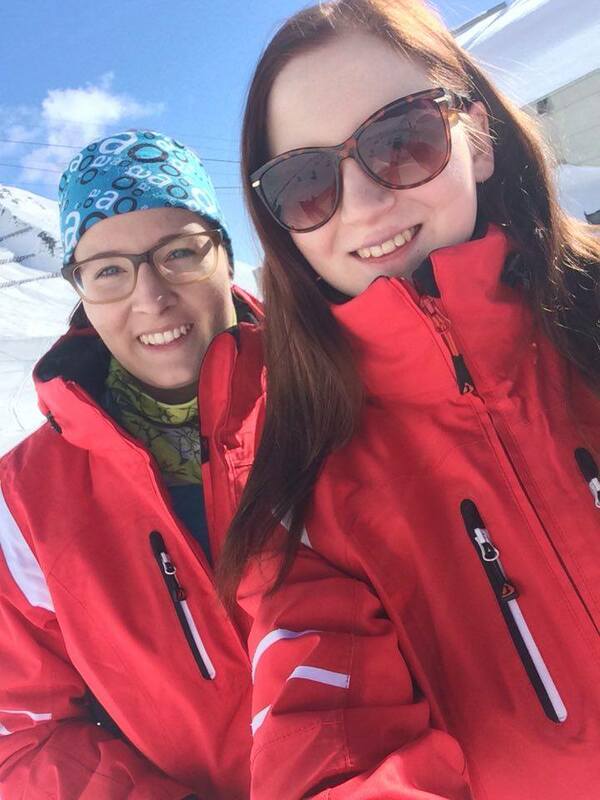 This week we all worked on the slopes, Tiia and Tanja at Nordkette and Mandi at Patcherkofel. Job was the same as always. We also had a visitor from Finland this week. Tiias boyfriend Aleksi was here from Monday to Friday. We all drove around the city by bus and show places to him. 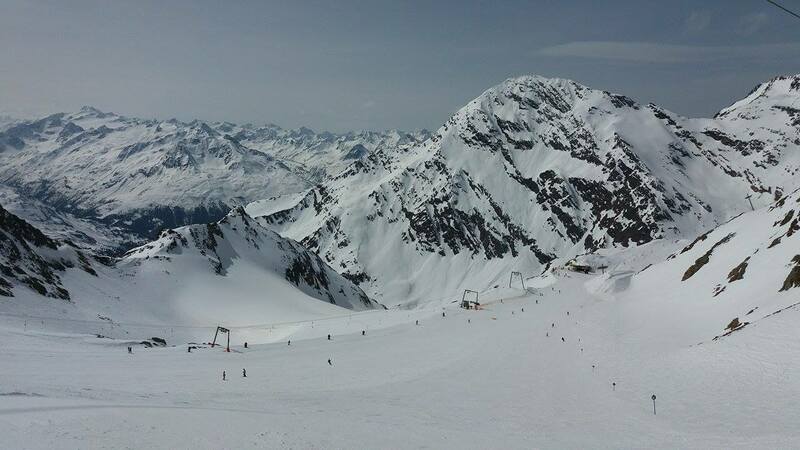 We were also skiing in Patcherkofel. 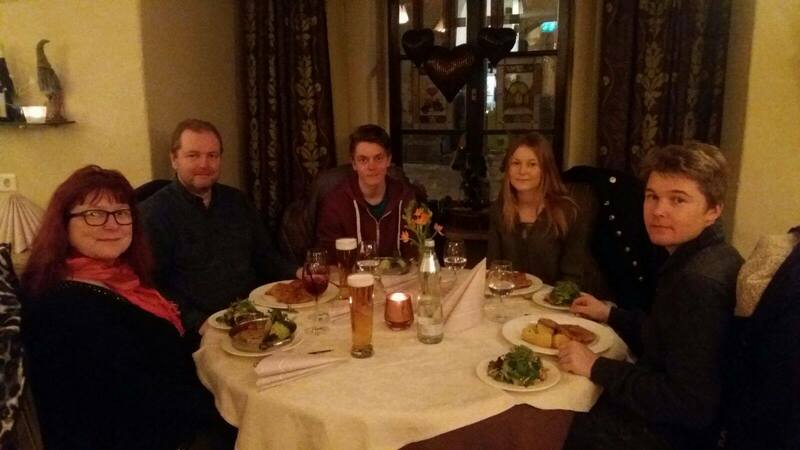 On thursday we were eating in Indian restaurant. 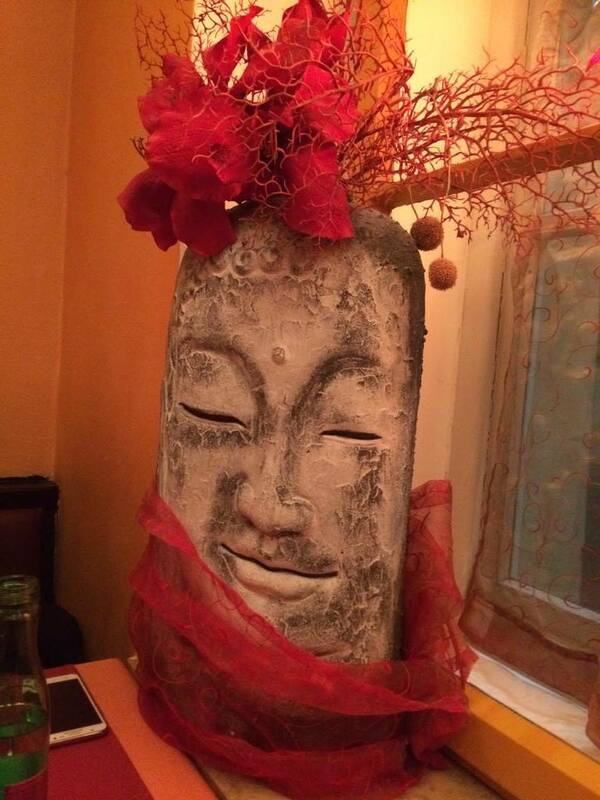 Food was very tasty but service was not so good… As soon we went in we noticed that waiter had bad day. He was very rude. The cardmachine was broken and he didn’t even apologied when we had to walk kind a long way to get cash from the atm. Tanja had birthday on Friday and we celebrated it in a café. 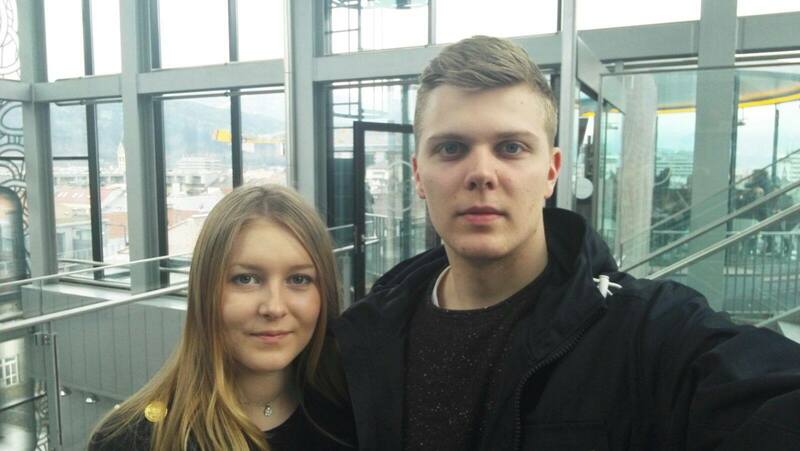 On Friday Tiia and Aleksi visited Alpenzoo. 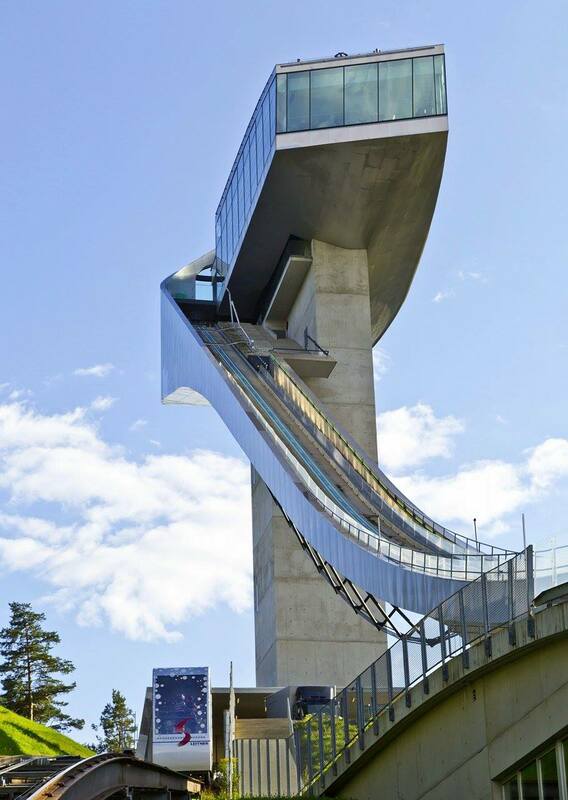 It’s one of the highest located zoos in Europe. 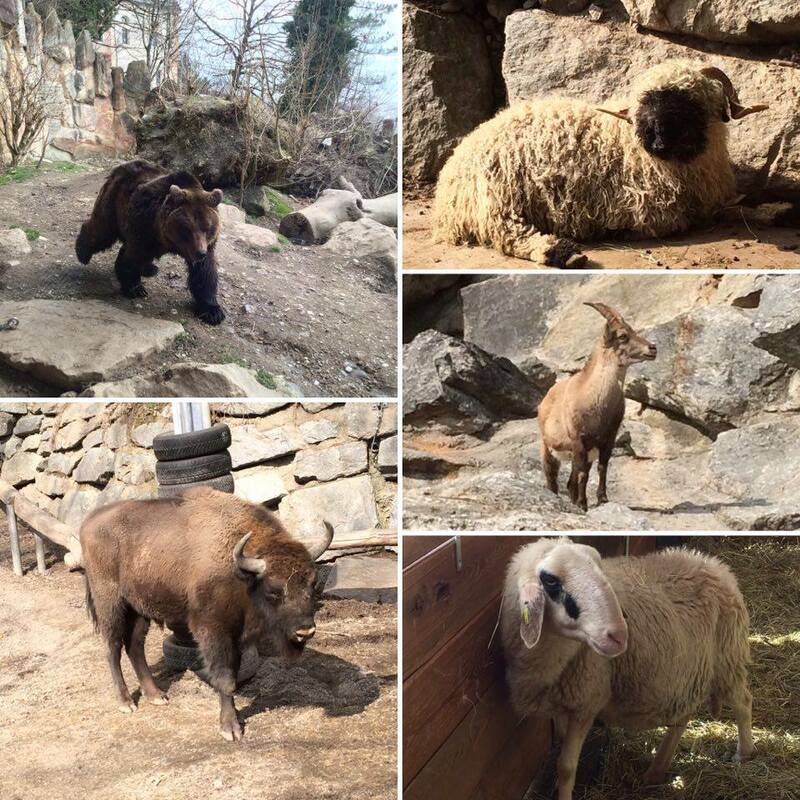 There were lots of animals, for example bears, goats, different kind of birds and wisents. 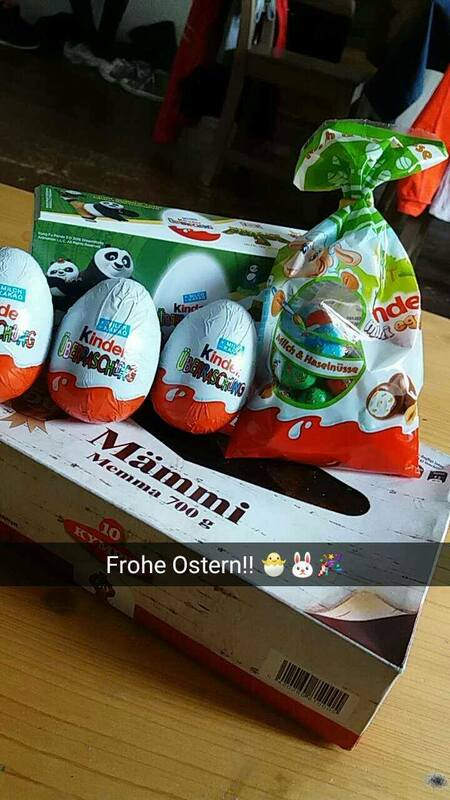 Hallo und Grüße aus Österreich! We have been here for one month now and we are still wondering where is our homesickness?! 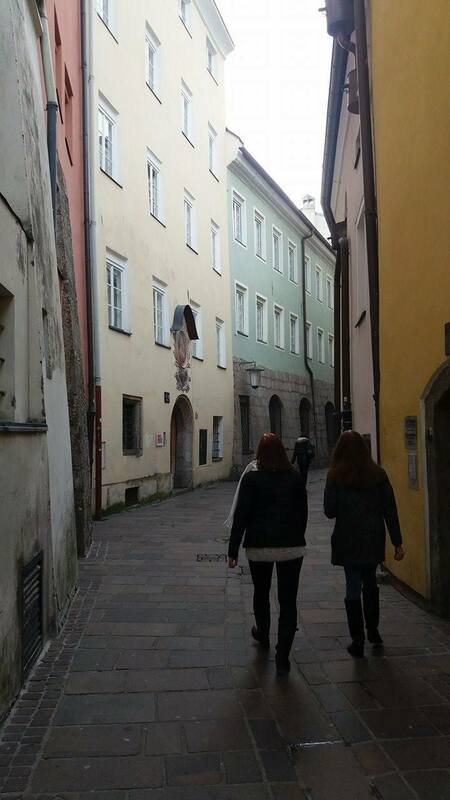 During this week Tanja and Tiia were in Patcherkofel. Tiia taught to Tanja how things are working in the office. Unfortunately peak season is going to abate gradually. Because of that this week has been kind of quiet. Luckily our boss Michael said that there are coming more customers next week. 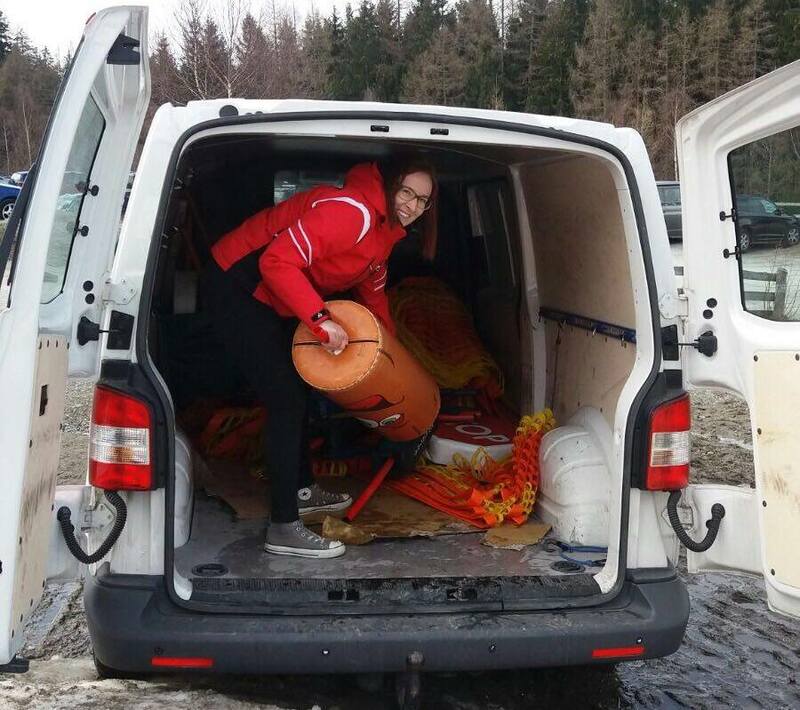 At the beginning of the week Mandi was helping with the kids in Nordkette. However there wasn’t much to do so she started to do a task which Michael has given to us. 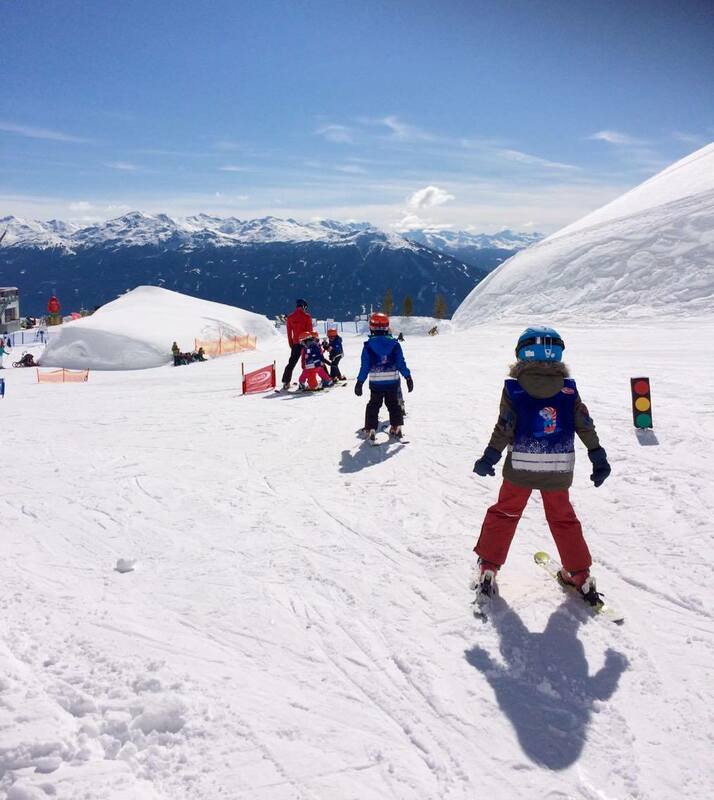 We have to search travel agencies from Scandinavia where skischool could market itself for next season. 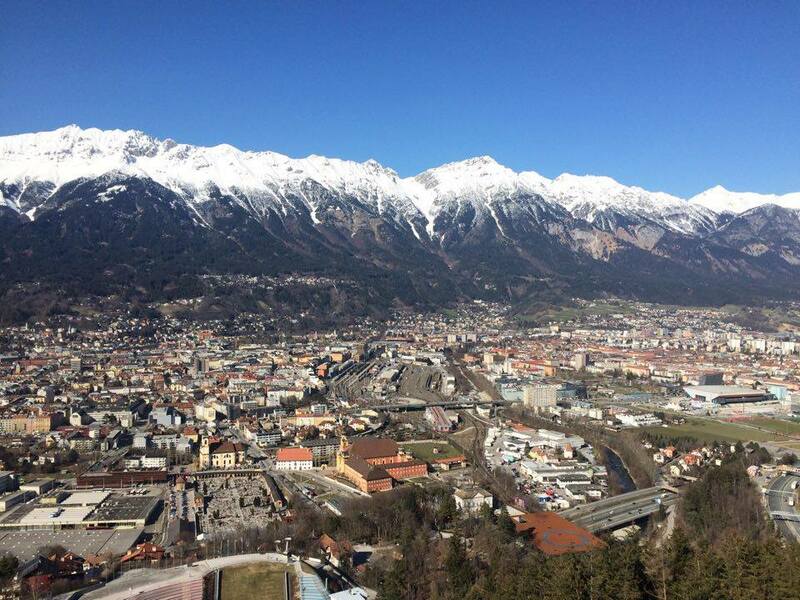 Here you can see one of the most popular sightseeings in Innsbruck. 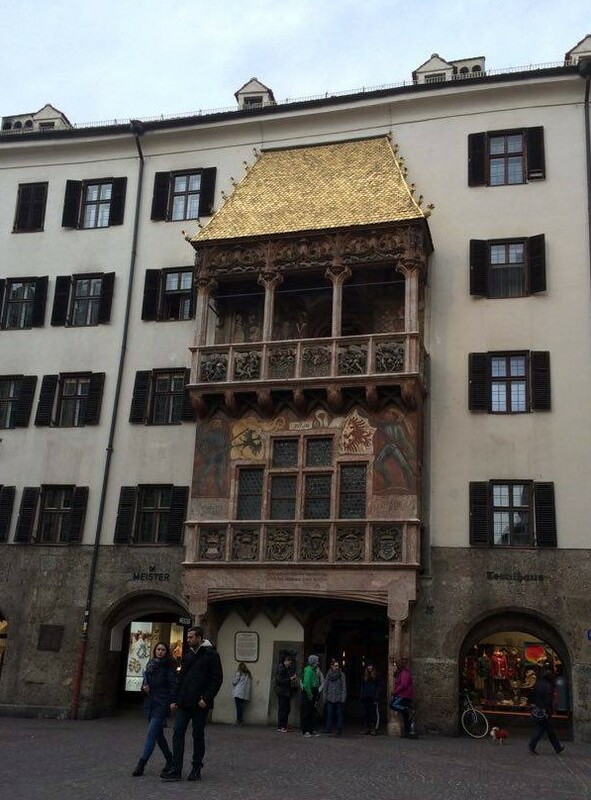 It’s called Goldenes Dachl (The golden roof). It’s located near by our apartment. The Goldenes Dachl was built for the memory of the second marriage of emperor Maximilian I. The reason was that Maximilian wanted to abrogate the rumors about the weak financial position. The roof is 16 meters wide and it’s made of 2657 coppertiles. 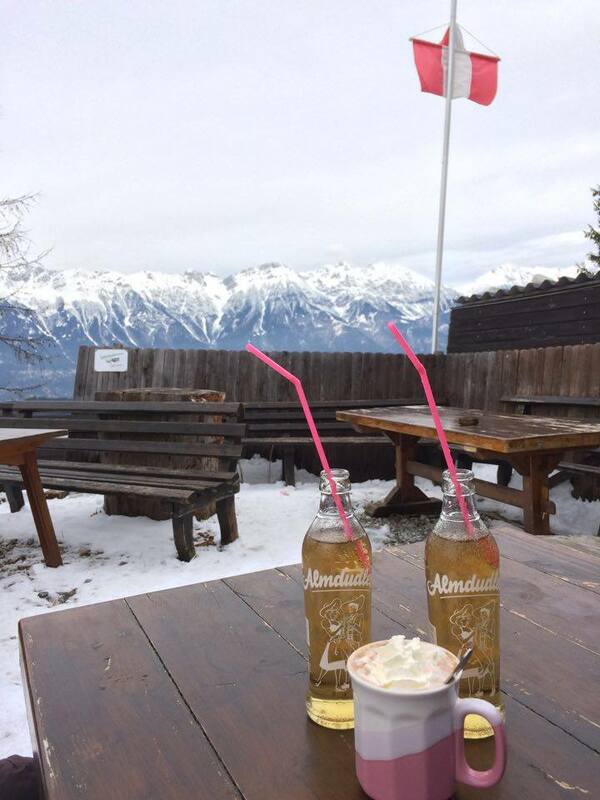 Mandis family were here for a winter holiday. Mandi and they spent time together. 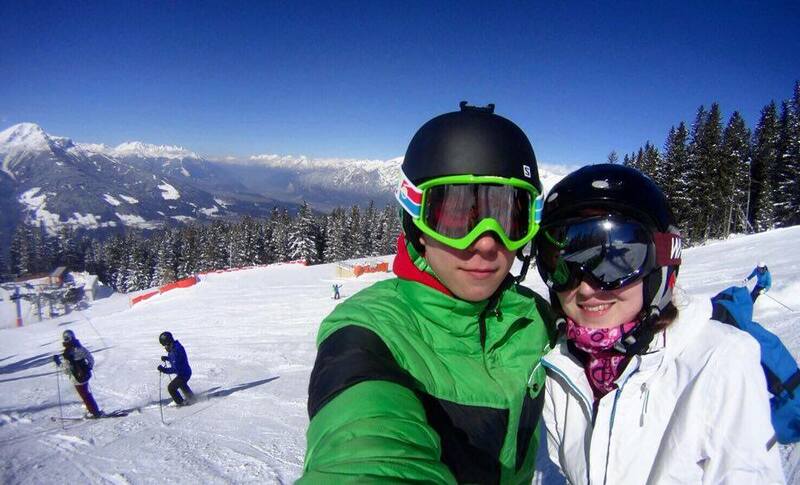 They were skiing, shopping, looking around the city and eating in nice restaurants. 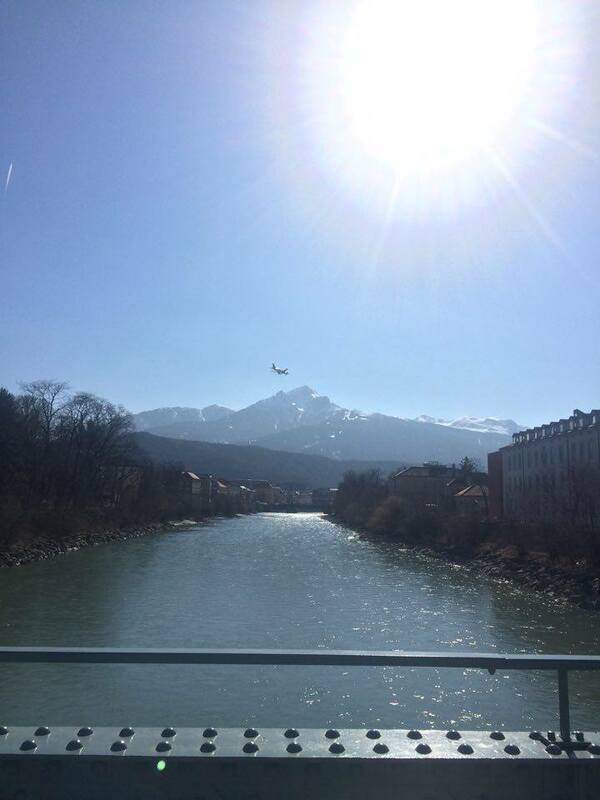 What’s going on in Innsbruck? 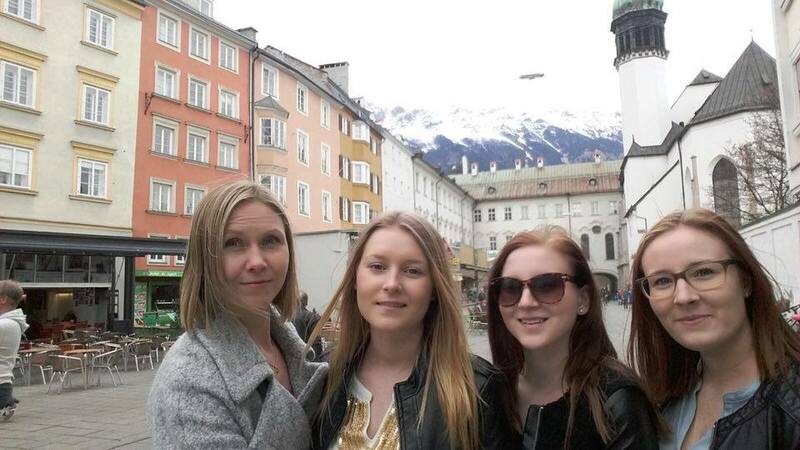 Our second week in Innsbruck is in the end. This week went fast and we got in touch with work. Things are getting clear little by little. 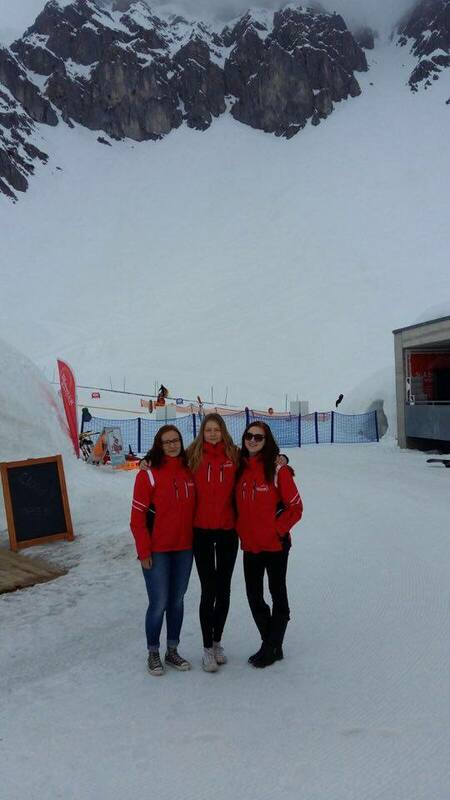 During this week, Tanja has been in Nordkette and Tiia and Mandi have been in Patcherkofel. In Nordkette, there was a big school-group from local school. 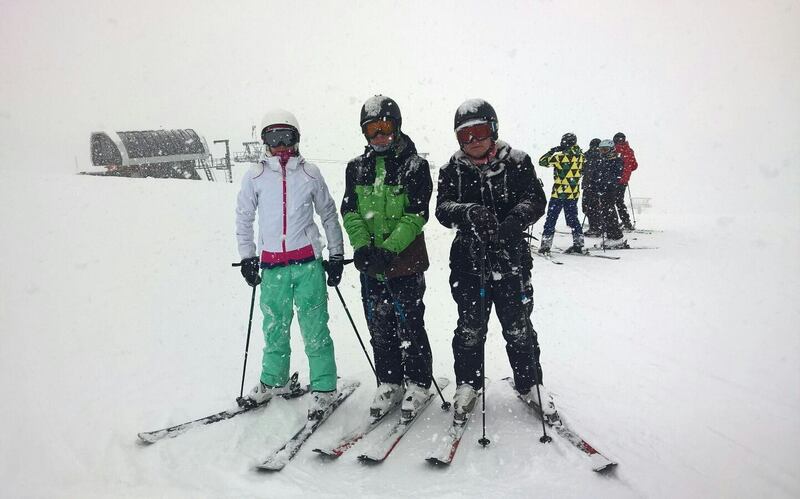 Tanja helped skischool instructors with the beginners. 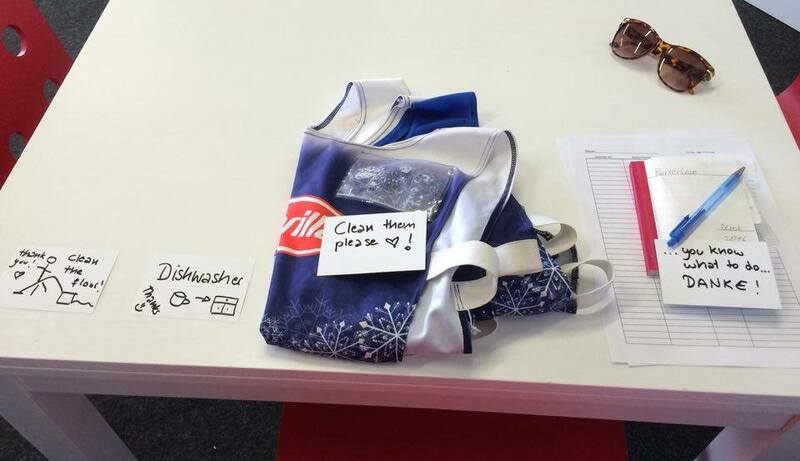 On thursday she was doing also officeworks. 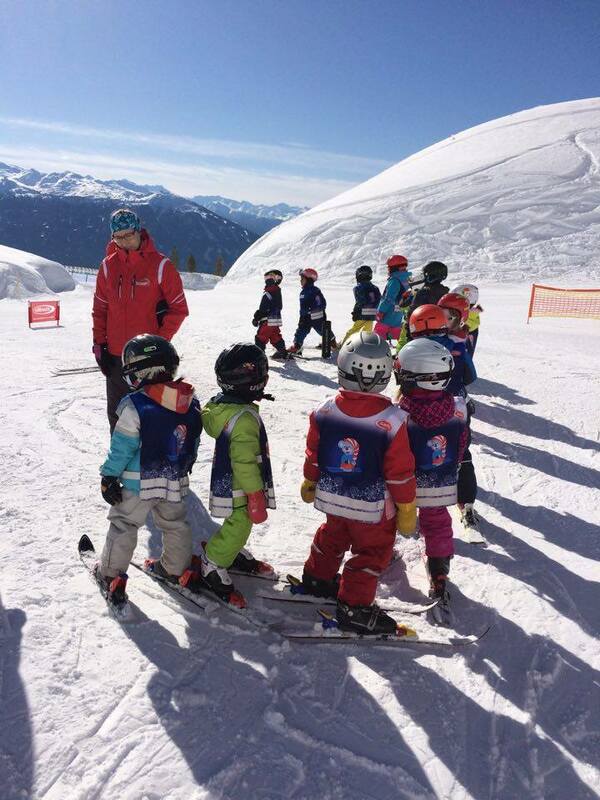 In Patcherkofel, Mandi worked with the group of the beginners on the slopes. 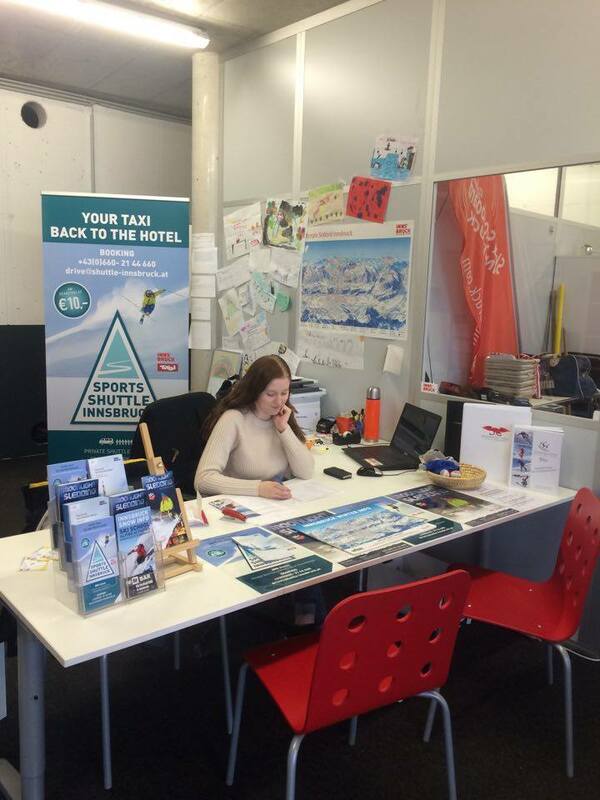 Tiia worked this week in the office and started to learn how to book skilessons etc. 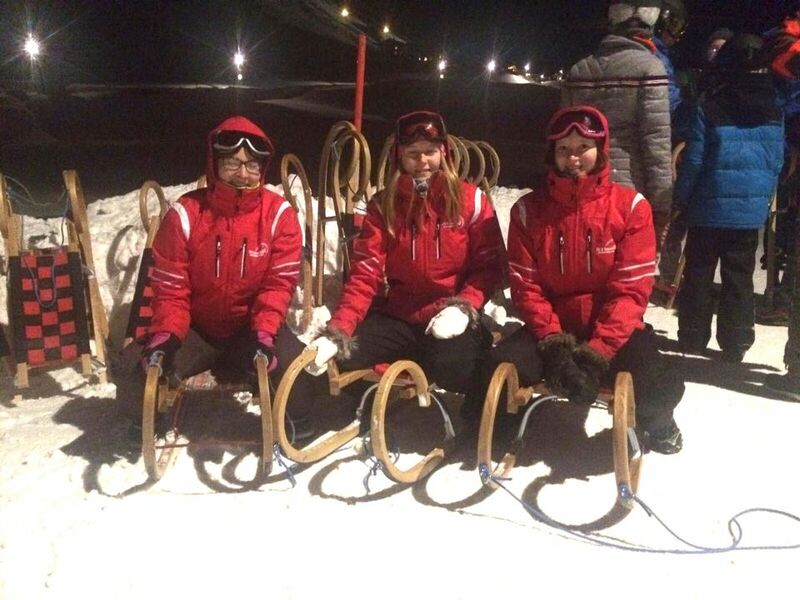 Every Wednesday night skischool offers possibility to go moonlight sledding safari. Its for adults and older kids. 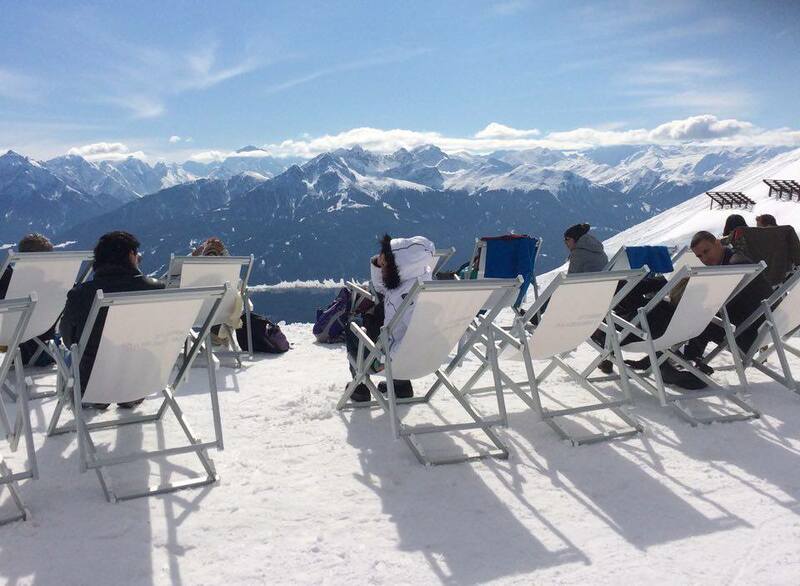 Safari is in Kühtai mountain which is an hour away from city of Innsbruck. 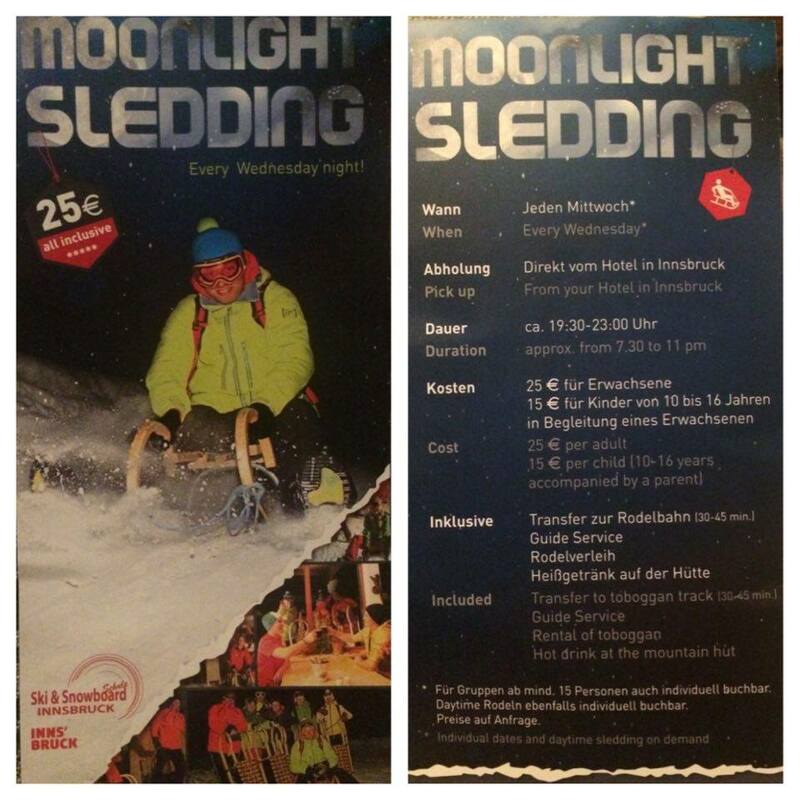 Safaris price (25€/15€) includes transfer, rental of toboggan, hot drink at the mountain hut and guide service. This week we took part of it. It was great experience and all the customers enjoyed it. Tällä viikolla meille tuli selväksi, että Itävallassa on todella tiukka lainsäädäntö koskien työelämää. Työskentelymme hiihtokoulussa oltiin pantu merkille ja epäilykset laittomasta työskentelystä olivat heränneet sosiaalivirastossa. Sekä hiihtokoulun johtajat ja me jouduimme epämiellyttävään tilanteeseen tiistaina. Meidät kutsuttiin virastolle kuultavaksi. Viranomaiset halusivat tietää täällä olomme todellisen syyn ja varmistaa, että kyse on koulutukseemme kuuluvasta työssäoppimis-jaksosta, eikä virallisesta työsuhteesta. Palkaton työharjoittelu on Itävallassa täysin vieras käsite ja siksi asia herätti täällä kummastusta. Asiat ovat onneksemme nyt kuitenkin kunnossa ja saamme jatkaa harjoitteluamme täällä kuten ennenkin. Päivät täällä kuluvat nopeasti ja kaupunki alkaa olemaan pikkuhiljaa tuttu. Joka päivä oppii kuitenkin jotain uutta, niin työssä, kuin vapaa-ajallakin.